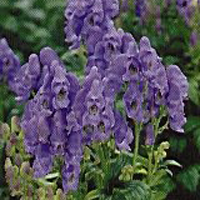 'Stainless Steel' Monkshood was introduced in 1998, so is a relatively recent variety. 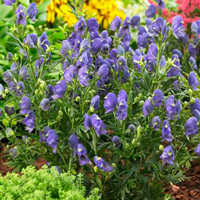 It is more compact & lush than the wild species, Aconitum cammarum, or Bi-color. 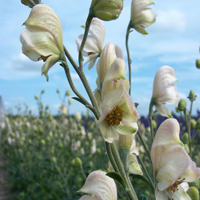 It grows into a one or two foot clump of deeply divided leaves, with three to four foot spikes of helmet-flowers. 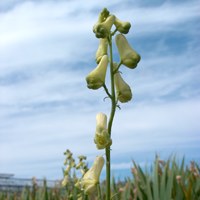 It usually flower July & August, but depending on zone & conditions it can flower earlier or later. 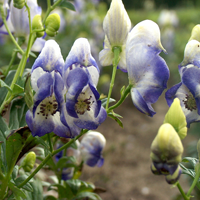 Rich blue, hooded, flowers, shaped like a monk’s cowl, July to September. 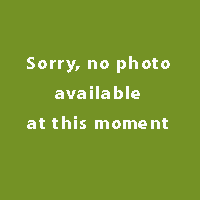 Dark green, deeply cut, leaves. Height 120cm. Spread 30cm. 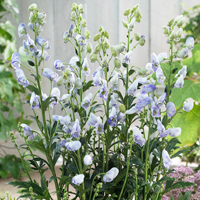 Spikes of helmet shaped flowers of blue and white in July and August.Dark green deeply cut leaves. Height 90 to 100cm. Spread 30cm. It wants persistently moist well-draining soil in a sunny location or very slightly shaded; it will not bloom well in much shade. Propagation is by division every few years, though an established clump never really likes disruption. 'Pink Sensation' does not grow true from its seeds. 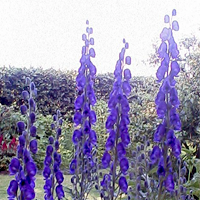 Spikes of helmet shaped deep blue flowers in July and August. Deeply cut glossy green leaves. Height 120cm. Spread 45cm. The plant is a hardy perennial, with a fleshy, spindle-shaped root, palecoloured when young, but subsequently acquiring a dark brown skin. 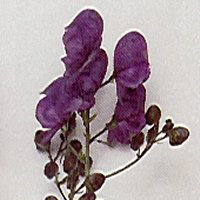 The stem is about 90-95 cm high, with dark green, glossy leaves, deeply divided in palmate manner and flowers in erect clusters of a dark blue colour. 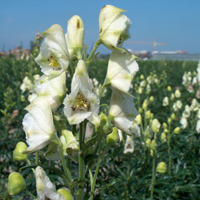 Aconitum napellus 'Rubellum' (Monkshood) is a spectacular plant for the middle or the back of the border, with graceful spires of pink hood shaped flowers (hence the name 'monkshood') from mid-summer on above attractive finely cut leaves. The height is about 0.75 to 1 meter. Spikes of small ivory coloured flowers, May to july. Dark green deeply cut leaves. Height 90cm. Spread 20cm.